The Christ Child, also known as Divine Infant, Baby Jesus, Infant Jesus, Child Jesus, the Holy Child, and Santo Niño, refers to Jesus Christ from his nativity to age 12. Upon reaching 13 years-old he was considered to be an adult in accordance with the Jewish custom of his time. The canonical Gospels lack any narration of the years between Jesus' infancy and the Finding in the Temple when he was twelve. From about the third or fourth century onwards, the child Jesus is frequently shown in paintings, and sculpture. Commonly these are nativity scenes showing the birth of Jesus, with his mother, Mary, and his foster father Joseph. The growth of images being made were quite popular among nobility, while some images were also used to colonize kingdoms such of Spain and Portugal. 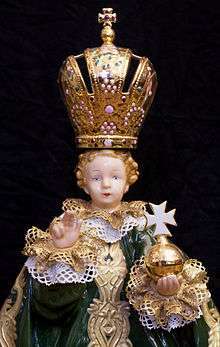 Colonial images of the Christ child also began to wear vestments, a pious practice developed by the santero culture in later colonial years, carrying the depiction of holding the globus cruciger, a bird symbolizing a soul or the Holy Spirit or various paraphernalia related to its locality or region. Tàladh Chrìosda (Christ Child Lullaby) is a Scottish carol from Moidart, Scotland. The Catholic priest Father Ranald Rankin, wrote the lyrics for Midnight Mass around the year 1855. He originally wrote 29 verses in Scottish Gaelic, but the popular English translation is limited to five. The melody, Cumha Mhic Arois (lament for Mac Àrois), is from the Hebrides and was a sung as a protective charm for the fisherman away at sea. The rhythm mirrors the rhythm of the surf. It is sung in the Hebrides at Midnight Mass of Christmas Eve. A number of apocryphal texts, the Infancy Gospels grew up with legendary accounts of the intervening period, and these are sometimes depicted. These stories were intended to show Jesus as having extraordinary gifts of power and knowledge, even from the youngest age. One common pious tale has the young Jesus animating sparrows out of clay belonging to his playmates. When admonished for doing so on the Sabbath, he causes the birds to fly away.